I was craving Italian food and decided to go to Bocca di Bacco in Hell’s Kitchen, a restaurant I had on my list for a while. I admit that that I did not know what to expect and had a wonderful time with my wife Jodi and my nephew Valentin. As a cocktail, I chose the Dolce Amaro, made with Jack Daniel’s Tennessee honey, mango purée, bitters and a cinnamon stick. Very good, it was well balanced and had a nice sweetness. The only negative was the martini glass that I hate as I find that the first sips are always tricky, ending often either on the table or on my fingers...But it is just me! As appetizers, we shared the calamari fritti that had also fried zucchini. Delicious, it was not greasy and not rubbery at all. Then, we had the Involtini de Melanzane e Ricotta that is eggplant with buffala ricotta, tomato sauce and mint. That was one of the best I had: an eggplant improperly cooked would be bitter; at Bocca di Bacco, it was not the case at all: perfectly cooked, it was a very comforting dish. The Taglieri Neri Con Granchio, or homemade squid ink pasta with lump crab meat, baby arugula and tomato sauce. That was a great dish: the pasta was superb, bathed in a nice tomato sauce and lots of crab, the arugula adding a bit of bitterness to the dish. 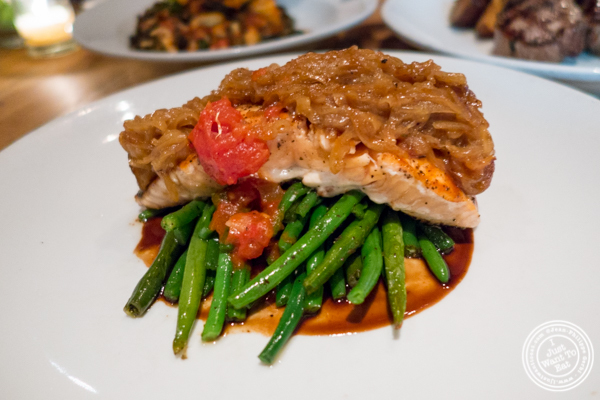 The Salmone Bocca di Bacco, an oven roasted salmon, served with caramelized onions, French beans and a balsamic reduction. Great dish, the salmon was perfectly cooked. And the Costelette d'agnelo, that are grilled lamb chops in a balsamic reduction, served with mashed potatoes. This was superb: the lamb was cooked medium rare and had a nice char. Last was dessert and we went for some classics. First was the tiramisu that was very good and quite light. The second was the panna cotta that was also perfectly made. It was overall a great meal, beyond my expectations. Bocca di Bacco is a great Italian restaurant that I definitely recommend!